Mid-1970’s, Yosemite Valley, California. This picture was taken by my then girlfriend and climbing partner Faye Nakamura. I’m not sure which climb we were on but it’s not a wall since I don’t have a haul line or aiders. You’ll notice a few “Friends” (expandable protection) on my rack on the right. These were original pieces made by and bought from Ray Jardine who invented them long before expandable protection became popular and generic. Most of the photographs we took on climbs in those days were slides and I have yet to scan my extensive and unfortunately deteriorating slide collection. I hope to get to it before it fades away. 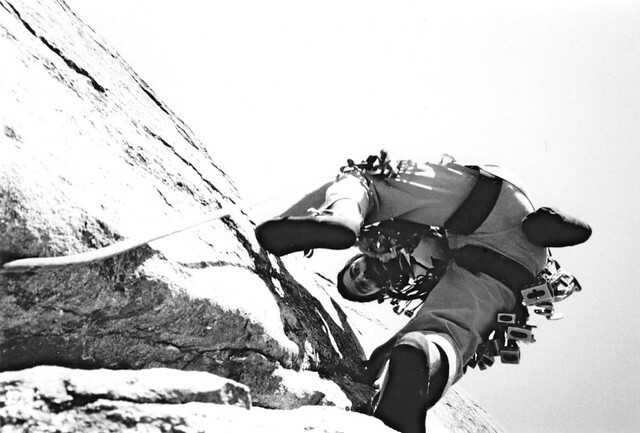 Yes, I was a serious climber for about ten years and climbed quite a bit in Yosemite Valley including some walls. These days my knees knock cleaning my gutters on an extension ladder and hiking is what I do for adventure. I’m glad I experienced the climbing scene when I did; I never got into the indoor climbing gym scene, competiions, or speed climbing with and without equipment. I was what modern climbers call a “trad” (traditional). For those of you interested in climbing (and entertaining stories), you might enjoy this (true) story I wrote a while back: A Climbing Story.